Like last March when we saw a series of major studio tentpoles open every week as if it were the summer movie season this March will be no different and kicking off major movie March this year is director Francis Lawrence's Red Sparrow. The director, who ushered Jennifer Lawrence through the majority of her Hunger Games stint has taken Justin Haythe's adaptation of the 2013 Jason Matthews novel and granted the actor what could be the beginning of a new franchise, albeit a more grown up one. I generally tend to like Lawrence as a director as I remember the guy fondly from MTV's Making the Video days when he orchestrated some of the more popular music videos of my formative years. Since breaking into feature filmmaking though, the guy has been able to craft generally original albeit big-budget films that range in genre from something like I Am Legend to that of the sorely underrated Water for Elephants. 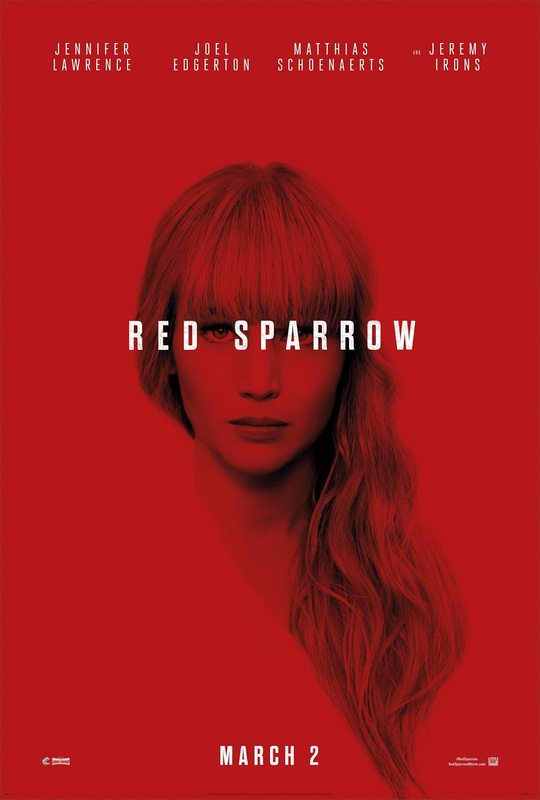 With Red Sparrow, Lawrence seems to have a very specific type of style and visual language as the film looks to be exactly that: one of pure style with the grace of the equation being brought via Jen Lawrence's performance. It should be noted also that this seems to be a very different type of performance than we've seen from Lawrence in the past. Not only is she doing an accent, but she is seemingly playing the victim turned hell fire in a way that is more bleak and more furious than anything she has been allowed to execute in the past. I love the color palette of this thing and the overall feel as well as the rather stellar, but understated supporting cast they have put together for this thing. I haven't red Matthews novel on which the story is based and focuses on Lawrence's Ballerina Dominika Egorova being recruited to a Russian intelligence service where she is forced to use her body as a weapon, but even if this stylistic excursion ends up being little more than a solid little spy thriller I don't think I'll be too upset as Lawrence tends to do more reliable than he does exceptional and sometimes, reliable is just what you need. Also, it doesn't hurt that we'll get A Wrinkle in Time the week after, or Tomb Raider the week after that, or Pacific Rim: Uprising the week after that, and then Ready Player One the week after that. So yeah, here's to March. Red Sparrow also stars Joel Edgerton, Matthias Schoenaerts, Charlotte Rampling, Mary-Louise Parker Jeremy Irons, and opens on March 2, 2018.